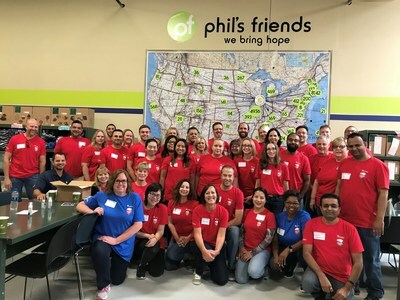 NORTHBROOK, Ill., Sept. 13, 2018 /PRNewswire/ -- More than 800 Astellas employees joined together across four countries to help their communities and volunteer at 16 local nonprofit organizations. The effort is part of Changing Tomorrow Day (#ChangingTomorrow) – an Astellas employee initiative dedicated to building stronger communities by giving back. Across the United States, Canada, Brazil and Colombia, employees volunteered at service projects to support cancer patients and their families, children's health and wellbeing, food security, childhood literacy, community members living with disabilities and more. "Changing Tomorrow Day is a tangible way Astellas employees can demonstrate our core value of improving patients' lives," said Percival Barretto-Ko, president of Astellas Americas. "We are honored to have the opportunity to support the work of dedicated community organizations whose sole mission is to address critical areas of patient need." Activities in the Chicago area took place at nine different project locations to benefit 11 nonprofit organizations, including American Cancer Society, Muscular Dystrophy Association and Lurie Children's Hospital. In Canada, more than 60 employees volunteered with Kits for a Cause and Wish of a Lifetime Canada to create more than 600 care packages. In Brazil and Colombia, nearly 150 employees volunteered at Associação Casa Madre Teodora dos Idosos and Fundación Sanar, respectively, to create and hand out kits to seniors and caregivers and paint, assemble and organize storage in the kitchen. These activities exemplify Astellas Americas' collective commitment toward improving the lives of our patients and helping prepare communities today for what can happen tomorrow. 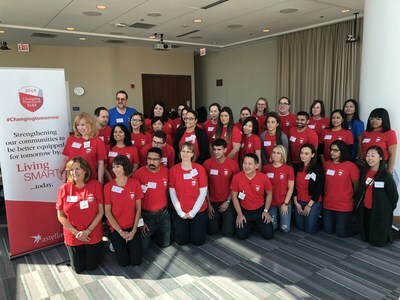 "Through the support of Astellas employee volunteers, our organization is better equipped to support cancer patients through treatment and recovery," said, Beth Thompson, American Cancer Society. "In our second year of partnering with Astellas for Changing Tomorrow Day, we couldn't be more thrilled to build on our joint progress in the fight against cancer." Changing Tomorrow Day is a series of company-sponsored volunteer events for Astellas employees to volunteer with local nonprofit organizations and make a positive, measurable impact in the community. Over the last four years, Astellas supported more than 55 non-profit organizations across the Americas as part of Changing Tomorrow Day and on a global basis, last year the company supported nearly 225 locations in approximately 25 countries. 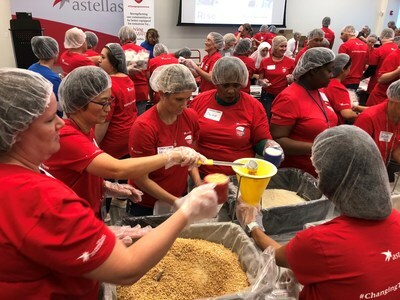 To extend impact throughout the year, Astellas Americas employees volunteer by taking advantage of a company-sponsored benefit of five paid days off annually to volunteer at a charitable organization of their choice. Astellas employees in the Americas have donated more than 110,000 hours of their time since 2009 to volunteer in their communities.